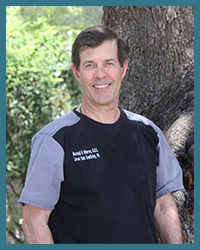 Dr. Warren is a 4th generation Texan who attended The University of North Texas, where he majored in Biology. He graduated with his Doctor of Dental Surgery degree from the University of Texas Health Science Center San Antonio- Dental School in 1988. As an active member of the River District Dental Society, The Texas Dental Association, The American Dental Association, UTHSC-SA Dental School Alumni Association, Dr. Warren is committed to public oral health, ethics, science and professional advancement. Dr. Warren has been actively involved in the New Braunfels community for over 30 years and can often be found volunteering at Sts. Peter and Paul Catholic Church where he serves as an usher, is a member of the Knights of Columbus fraternal organization and is active with the Men’s ACTS retreats. Dr. Warren married his dental school classmate and sweetheart, Mary Rita, a retired pediatric dentist. They have two adult children; Logan married to Iliana and Janae married to Ryan. They are most proud of their ever-growing family and are embracing their new role as grandparents. When not practicing dentistry, or spending time with his family, Dr. Warren enjoys all things outdoors, hunting & travel.